please help me with my power point on the goldden temle quickly pls i have been there before but can’t rember facts about it. im the teacher HOLLY METCALF!!!!!!!!!!!!!!! a lot of imformaton !!!!!!! hey no worries. 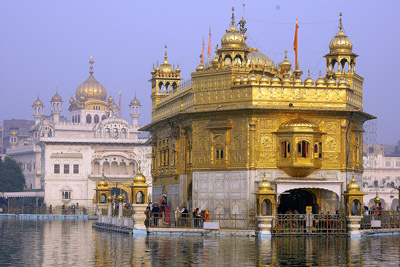 the golden temple is a sikh temple in amritsar. the temple is golden plated. the guru granth sahib is at the top of the temple. you can go in to see the copy while they pray and the original is at the top. non touched. arrghhhhhh just apreiciate it !!!!!!!!!!!!!!! ummmmmm. need few interesting facts on golden temple even though i should know alot more bout it since i am a sikh lol. but hey im born and live in New ZEaland. soooo not really my fault. so plzzzzzzzz need interesting, not boring, facts on the golden temple. it was good but i need more facts, the entire temple is made of gold or not? I need help for my project and you gave me info. about it.. Thank you! Golden temple is the shirne of sikh peoples. its like mecca for them as important as like ganges . they have wish to go our there for workship and have bath in holy pool once in his or her life . it was built by the fifth master of sikhism in 1601 . Wow that is amazing! I JUST CAN’T STOP LOOKING AT THE BEAUTIFUL, GOLDEN TEMPLE. This really helps me do my homework! this is not really facts. Its all confusing history. could you please not go into so much depthy information and give us the main facts and point. It would be so much easier. thx now my homework is done! We visited Golden temple last week and had lunch also in the lungar. Really very religious temple worshiped,where we get peace of mind and “Bhakti” towards almighty. We were keen to know what deity or only GURU GRANTH is worshiped inside the temple, as we saw many worsipping places around the parikrama and also in first floor of the main temple where GRANT was being read. Wow, wonderful blog layout! How long have you ever been running a blog for? you make blogging glance easy. The whole look of your web site is fantastic, as well as the content! i think its just a fake thing and m nt intrested to know anything about it.. It sounds really good and really famous thanks for telling me now my teacher will impressed THANKYOU MAKING MY WORK EASIER!!!!!!!!!!!!!!!!!!!!!!!!!!!!!!!!!!!!!!!!!!!!!!!!!!!!!!!!!!!!!!!!!!!!!!!!!!!!!!!!! !